Whitmore Lake, Michigan (January 11, 2019) – After 38 years in business, America’s leading artisanal pasta makers continue to innovate. Although rooted in Old World traditions, Al Dente reflects a 21st century global sensibility; one that recognizes changing trends in the market. The company’s ethos of innovation has led to their latest product line, one that serves its loyal customer base while responding to changing market demands. With this in mind, as more Americans place a premium on their health through better diet, Al Dente® has launched a line of plant based pastas that offer a healthier alternative to a meat-centric diet. Always true to the Al Dente brand, these pioneering pasta makers have sacrificed none of their traditional methods or values in creating fresh taste, homemade texture and a three-minute cooking time. The common thread linking all of Al Dente’s pasta offerings is a focus on quality ingredients and artisanal production. “The ingredients in our plant based pastas were chosen not only for their exceptional nutritional value but, equally important, for taste, texture and visual appeal,” says Monique Deschaine, founder of Al Dente Pasta Company. The unique flavor combinations include Chickpea Turmeric, Green Pea Wild Garlic and Red Lentil Sweet Potato. The chickpeas, green peas and red lentils are high in protein and provide excellent sources of fiber, vitamins and minerals. Turmeric is considered the most effective nutritional supplement in existence with many powerful medicinal qualities. Wild Garlic is known for its antibacterial, antibiotic and possibly antiviral properties. Sweet Potatoes are an excellent source of beta-carotene. Created in collaboration with an outstanding family of European pasta makers, Al Dente’s new Plant Based Pastas have received unprecedented acceptance from leading retailers such as Meijers and Sprouts who placed orders in advance of the official roll-out, a promising indicator of the anticipated demand for a plant based, gluten-free pasta sure to be a stand out. After all, in a sea of pastas that come packaged in a box, Al Dente’s latest offerings present a clear choice in a clear bag. With nothing to hide and everything to show, these Plant Based Pastas are not only high protein, gluten-free, certified organic and GMO-free, their unique flavor combinations form a delicious foundation for any recipe, all without sacrificing taste or texture. Since their humble beginnings in a friend’s kitchen in 1981, when the Deschaines were rolling out classic pastas such as squid ink, spinach and spicy sesame fettuccine and linguine, Al Dente went on to create other successful pasta products. Diet specific Carba-Nada®, the number one fettuccine on Amazon, is a reduced-carb pasta favored by Weight Watchers, foodies and the diabetic community alike. Piccolo Pastas, introduced in July 2018, are brand new pasta shapes never before seen in North America. Not only are these shapes unique but so are the names: Turmeric Pinchetti™, Golden Egg Bonnetti™ and Spinach Farfalletti™. The Piccolo Pastas were immediately featured in the New York Times and picked up by Publix. 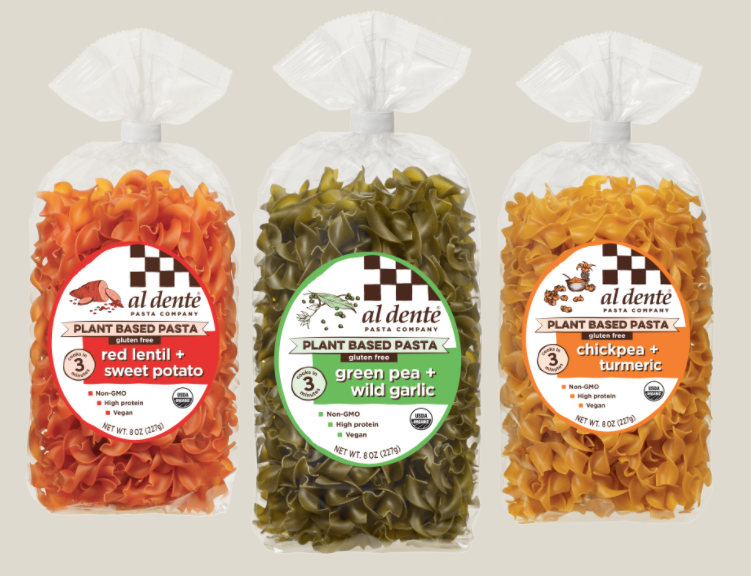 Al Dente’s newest Plant Based Pastas are packed in 8 oz clear bags and retail for approximately $3.99 to $4.29 and will be on store shelves beginning in February of 2019.